We try to take feedback directly to our team and get the easy stuff fixed as fast as possible, then reply quickly, too. 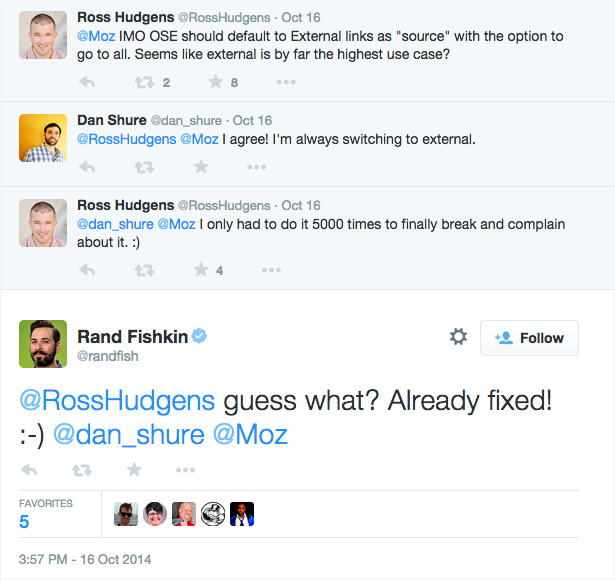 Ross & Dan are both long-time, loyal Moz customers and evangelists for us. Fixing this was ~1hr of engineering effort, so we brought it to our devs, they fixed it, and within a few hours, we were able to report back that a solution had been made! Visiting our clients in person goes a long way. Nothing replaces face to face even though we do a lot of our work on the web. Meeting face to face shows how committed we are to the relationship and brings up some conversations that would never happen online. We love being personal as a company and as a brand, so we’ll put handwritten thank you notes in our packaging. Our customers are why we build things, so sharing that with them adds something special to the experience. I think this personal approach is why many of our customers have become brand advocates for us and referred us to friends and contacts. How do you want the experience to be for your customers? Write actions you can take that would give them that experience. Insert actions into appropriate place in your fulfilment process. Ensure documented steps are followed the same way by all staff so that all customers get an identical amazing experience. All companies that deliver consistently great customer service take the time to be intentional with a similar process. Since our engineering and product folks are the ones doing the support, we’ll take those suggestions and when feasible, try to build into the product. When we email the customer saying “Remember when you wanted XYZ to be possible on CB Insights? We built it. Thanks for the great suggestion”. They are always surprised and delighted. I like to periodically call or email clients when I have a random idea about their business. Even if nothing comes of it, it’s a “just because it’s Wednesday” thing and shows them you’re really investing in the relationship. When you’re just starting, subscribe to all of your customers’ newsletters and blogs. Leave comments, retweet posts, upvote … whatever. It takes practically no time but sends and unambiguous message that you care about their success. We’ve gone through a few times where we ran out of inventory in our warehouse but kept selling the product on our website. The customer would then get an email notifying them the item was going to ship in less than a day when really it wasn’t. We took the time to call everyone impacted and give them a coupon code worth the total value of their order. In the short-term we spent a lot of time and lost a lot of money doing this, but it helped us build a deeper level of trust between us and our customer base. Not 1 email or 1 Tweet goes by that I’m not paying close attention to what my audience and customers are telling me. They reveal to me their biggest pain points and struggles, and I create the content that is going to help solve them. We invite our customers to co-create new products, and features with us. This makes them happy, because it creates the ‘IKEA’ effect. This happens when customers value products, higher than they otherwise would have, because they helped to build it.